A forum for artists working with objects and a repository for ideas to inform our practice. All submissions welcome! The plate is solid brass and is very heavy to lift. But it wasn’t always a plate. 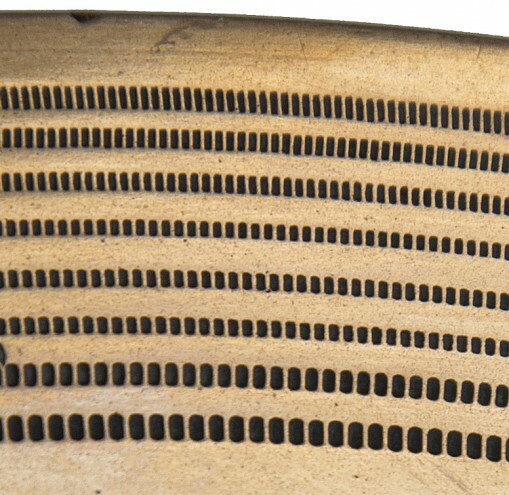 It was in fact a shallow cylinder with thousands of tiny pin prick holes drilled in by hand, applied in a regular, graded pattern. Not regular enough as it turns out. 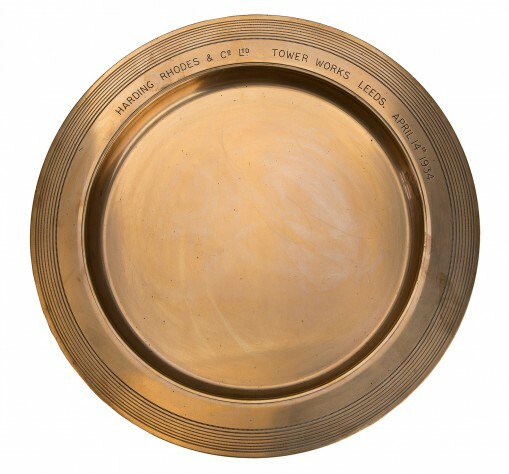 This plate sat in the boardroom of Hardings Tower Works http://en.wikipedia.org/wiki/Tower_Works from 1934 until 1981. I can dimly recall the boardroom; all shiny mahogany and glass cabinets. I might have had a more complete picture to imagine, had I ever been allowed to get more than a glimpse. On rare occasional visits to the upper sanctum I would pass an open door or maybe even sneak a peek if no one was around. These were the days of established hierarchy; of knowing your place and generally accepting it. Nowadays we argue the toss of social position. Am I working class, lower middle class, middle class, ruling class? Personally I go for the homogenous description of ‘educated class’ but apparently that’s just something I made up, and I am told by those who study such things that there are now other nuances, other subtleties that describe the complex web that is the current British class system. Maybe I am an inverted snob, but I would much rather be described as working class than aspiring middle class. That just seems pretentious and a denial of my family background. Of course a certain historical serendipity provides me with the privilege of not requiring to aspire to anything in particular anymore. To understand how this plate sits in my own life you have to understand that when I was growing up my father was the shop floor manager of the factory that made this object. I say ‘object’ because I don’t actually know what it would have been called. I do know its purpose though. 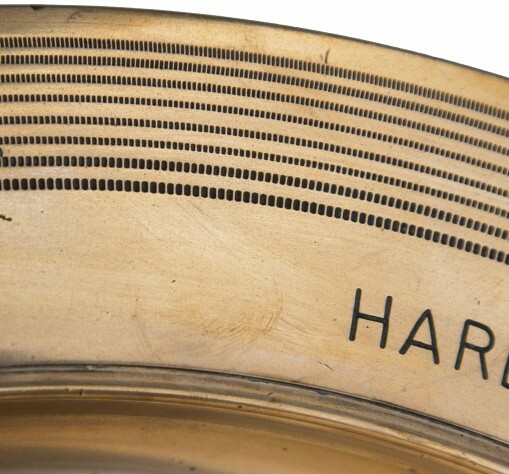 Through each one of those tiny holes there was to be a corresponding tiny pin and, once all of those holes were occupied, the resulting fine cylindrical comb was shipped off somewhere exotic like India and placed on a shaft which would spin it round. Its purpose in life was to comb wool; but not just any wool. This particularly fine comb was for the finest of wool…mohair. My parents have just moved home to a place where they can get more care. Everything needs more maintenance in the end (although this plate has survived thus far remarkably unscathed). On clearing out their previous flat there are things that won’t make the next stage of their journey and so I have come to be the possessor of this plate. Yes it’s a plate not a comb. It is a plate because the (almost certainly man) who drilled this (almost) perfect grid of holes one by one, by hand and eye, made a mistake. Where that mistake is I cannot find. I am led to believe the holes are somehow not absolutely in line and for that reason it was rejected. WTF you may well ask. But this object represents a lot of man hours of work and a not inconsiderable amount of brass, so Yorkshire men being Yorkshire men, they resolved to have it made into a plate by adding an inner recessed base. Engraved with the date, it was then placed in the opulent Victoriana Tower Works boardroom as a rather odd (if one thinks this through) homage to their industrial prowess. A mistake, saved from disaster by lateral thinking. Even though the boardroom always gave off an aroma of polish, they could never quite eradicate that other ingredient… sweet oil, some fresh, some stale and ingrained into the walls, that was the perfume of industry. Downstairs wide open factory floors housed regiments of lathes, each one manned by a predominantly Indian or Pakistani turban clad work force. A cheerful bunch who may not have identified themselves as ‘working class’ due to their own particular, even more complicated, social conventions unpacked from immigrant baggage. My connection to Hardings was as a boy either as an occasional visitor, made a fuss of by the office staff, or as a temporary labourer during academic holidays. When I grew my hair from the age of fourteen onwards, I would often have to wait for what seemed like hours on end in the car outside the factory. I guess my father wasn’t plugged into the hip ‘n happening world of youth culture and was a little embarrassed at my appearance. Strange now I think back. We rarely saw it but, wrapped up in turbans, those hard working optimists also sported flowing locks. Long hair was cool in my world then, and not least because the Beatles had discovered the Maharishi Mahesh Yogi and travelled to India. We took from them, they took from us. Between sixth form and college my summer job was chipping the limescale off the boilers in the Hardings factory. A hard, unremitting, boring, tedious, filthy, damp sort of a job, but I got paid and I was on my way to art college so not all bad. As I continued my education the plight of manufacturing in Britain wasn’t exactly foremost in my mind, but none the less it was declining despite my averted gaze. The miners kept reminding us something was up though. Turn around and it’s gone. A failed attempt to diversify to no avail. The doors closed at the Hardings factory in 1981. The auctioneers hammer saw many of the beautifully robust components of another age go to scrap merchants. My father had managed to move on but went back for the memories. He bid for one of the lathes, which he then offered to the local industrial museum, but they had not space. It sat in our garage until eventually he had to admit defeat and sell it for scrap too. But he also bid for the plate. It was never displayed in our house, instead hidden away at the back of a wardrobe until today. Now it is mine I feel I have a duty of care. My experience of walking those factory floors, of imagining the kind of life the Tower Works represented, and my determination to not follow a similar career path to my father, is part of my own history; a diametrically opposed path from manual labour to more cerebral concerns. The lathe workers of yesteryear might now work in call centres – but just as a temporary measure on the way to who knows where. We don’t now expect jobs for life. But this story has a happy ending. I am not so far from the man who drilled those fine holes. I too use hand and eye on a daily basis to earn my living. To make a buck I design things. I arrange things into shapes, layouts and visual patterns. They call it graphic design and it is a part of what I do away from being an artist. To do this I need commercial offices; somewhere to meet clients and generally to hang out. My current office is in a reclaimed building called the Toffee Factory http://www.toffeefactory.co.uk/ in Newcastle upon Tyne. http://www.tower-works.com site too. Both my Newcastle building and the Leeds building house ‘digital’ companies. Generally that means some form of contemporary computer based creative activity. From millions of tiny pins to billions of tiny digits – a stunning example of scaling things down to scale them up again. Digits don’t comb wool but they do control the machine that does everything faster and finer. It seems right that the plate really should reside in its place of origin as a reminder of this process. So 2015 shall be the year I make sure that it is returned (on loan, for I want to keep some thread of connection) to a suitable spot in the Hardings Tower Works factory. A testament to evolution. I will have just one stipulation…that it be displayed in a place accessible to all.